One of the best books written, if not the best, one which definitely out sells any other book is also one of the most skillfully put together stories of all time. Of course the author has more experience than any other author on (or off) this planet. 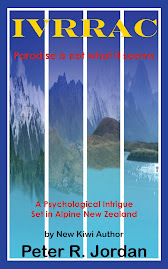 It begins with a seemingly simple story about a man and a woman in paradise. Of course human nature takes over and they stuff it up. They fall from grace and lose paradise, however the boss still cares for them clothing them as they are shown the door. As a father watches his child leaving home for his life journey knowing one day they will return, God watched his creation leave paradise. This is know as the fall and from then onwards man continues to fall and God continues to pick man up and dust off his knees. But there is still distance between father and son a distance created by the first fall. God chose one man, Abraham, to lead the way, choosing his offspring to be his chosen people. But this man was also promised that one day his descendant will bring blessings to all people on the Earth. After the descendants became a large group of twelve tribes God showed the way they could get closer to him. To be close to God a sacrifice had to be done, depending on the task and reason, it was either a goat, lamb or bull. But the people forgot and then remembered then forgot and then remembered. Finally after nearly 2000 years God intervened once more by impregnating a woman who was betrothed to a direct descendant of the great king David and thus Abraham. This man was therefore given descendant rights and was known as Jesus. He was God in human form. Through Jesus the whole world was blessed and through his death man could once more get closer to God, his death being the only sacrifice required. The weekend after next we celebrate this death (Good Friday) and the amazing resurrection that followed (Easter Sunday). Of course this is a very simple summary and does not do justice to the intricate weave that God created in his book "The Bible." But when you read it knowing the ending, you can see how the ending is foretelled in all the subtleties within the early sections. It is a book that never dates and the moral stories and examples are as relevant today as the were when they were first told. For instance the Corinthian letters could be just as relevant to some churches today as they were to Corinth in the first century. We still do the same faults again and again. Mankind has not changed, we may be able to do things faster and create more damage, but they are still the same issues. The great thing is that at the very moment Christ died on the cross our sins were forgiven. This is demonstrated by the temple curtain tearing in two, removing the barrier between man and God. By accepting this gift of grace and accepting Jesus we become close to God. We are still human and we fail. But the failure is forgiven allowing us to try once more and slowly we fail less often. So this Easter, invite Jesus to the party and enjoy life as we were created to do. And if we do we can be assured at the end of time we will return to a new paradise on Earth as existed in the beginning. And once again be in the presence of our father, the God.